Those of you online today will notice that I’ve discovered a new pet peeve. A group that winds me up more than men I date, you ask? Or rogue plumbers? 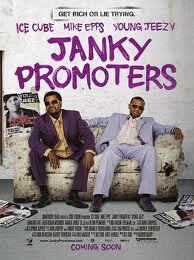 Yes indeed this group are are commonly known as promoters. Men who choose to make their money running events which are meant to entertain. Maybe it’s me but there are few that seem to have mastered the art of delivering a flawless event without stressing out the customer. That’s me. There was one New Year’s Eve when I was looking to party. I was told that to party at this event I would have to pay for the whole group in advance in cash. He would come to my house and pick up the tickets and check that I was indeed over 25. Now I know I’m always fibbing about my age but even I know that there is no strobelight strong enough for me to get away with 25. And it didn’t make sense. My age was in no way a reflection of the others in the group. But he was insistent. So he came…3 hours after the allotted time and then I had to come out and sit in his car as he counted the money and gave me his tickets. Turned out that I knew this promoter from when I was at school. He was STILL promoting now? Life clearly wasn’t kind. He then attempted to convince me that he was a huge promoter and that business was good and that all the other promoters copied their ‘business model’ of delivering tickets and personalising the experience. These are my words not his. He said something about checking to make sure people weren’t underage and that. Anyway we got to the event at about 10.30. There was a queue and we didn’t get into the venue until 11.30 after I had requested a few words with the promoter. I was cold and was not going to kiss people in a queue at midnight. Who knew what those coats might be hiding. The queue was full of kids which made sense they were made to wait as this was an over 25s event but when we got in we were greeted by more kids. Yes it was just us and the promoters who had seen 30. The promoter was about 48. He had time to have perfected his career surely? So I beg you promoters. Let’s put more concerted effort into making your events an enjoyable experience for all.